Looking for a grill that is Made in the USA, and reasonable priced, for your outdoor kitchen? 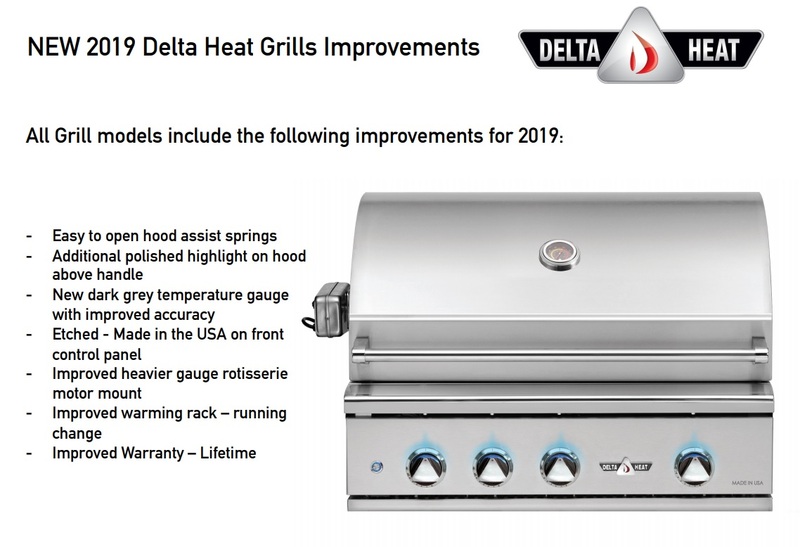 Delta Heat's affordable luxury selection of built-in grills should be at the top of your list. Available in 3 Built-in Sizes : 26", 32" and 38" and model is manufactured by Twin Eagles and features high quality materials and construction techniques like welded stainless steel, double lined hoods, interior lights, and electronic ignitions. All of this comes together for a grill that will not only look attractive for years to come, but will outperform competitors and cook your meals to restaurant-level standards. The 26" Grill is a two burner grill that does not feature a rotisserie back-burner. The 32" and 38" models have three burners and are available with or without a rotisserie as well as an option for a sear burner. They compliment their grills with all the essentials you need for your outdoor kitchen such as doors and drawers, Side burners and Bar Accessories for entertaining. Should you need replacement parts, we will not leave you up in smoke! If you are looking for Mobile Convenience, Do not overlook Delta Heat Grills on Freestanding Cart Bases.